The MakerLab is now open for the Spring 2017 semester. Be sure to come in and check out all of our new stuff we have. But before you come in, make sure to check our new hours! Remember, Wednesday is our 1 hour free print day. Meaning that if your print is printed in one hour it's free! Who doesn't like free? Speaking of free... If you don't have a lot of free time to stop by the MakerLab don't worry. You can now order your 3D prints online! The MakerLab is happy to announce that we have partnered with 3D hubs. 3D hubs allows you to send in your print file in STL format and we will print it for you. We will even ship it to you if you live out of state! 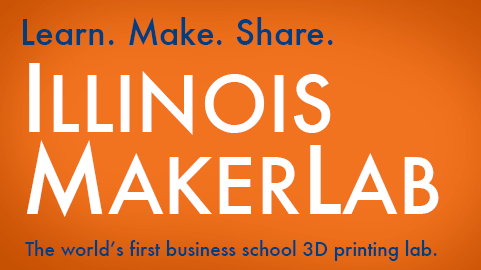 If you are a Illinois student or have an email ending in .edu be sure to register at https://www.3dhubs.com/students to save 25% on our online rates. Want to be a volunteer at the MakerLab? Apply to join the Spring 2017 MakerLab team! And don’t forget! Like us on Facebook, or follow us on Twitter and Instagram to get the latest news.